Starting and finishing in the alpine adventure capital of Queenstown, this route circumnavigates the Southern Alps and takes in their dramatic peaks, glaciers and lakes. Experience New Zealand golf at its best on this 12 day itinerary. Visit Jack's Point Golf Course, Terrace Downs, and Clearwater Resort in the Canterbury region before finishing back in Queenstown at The Hills championship course. In between rounds of golf, discover the beauty of the West Coast and glacier country, before making your way to Arthur's Pass National Park. On your route back to Queenstown you will make an overnight stop in the majestic Mt. Cook National Park. 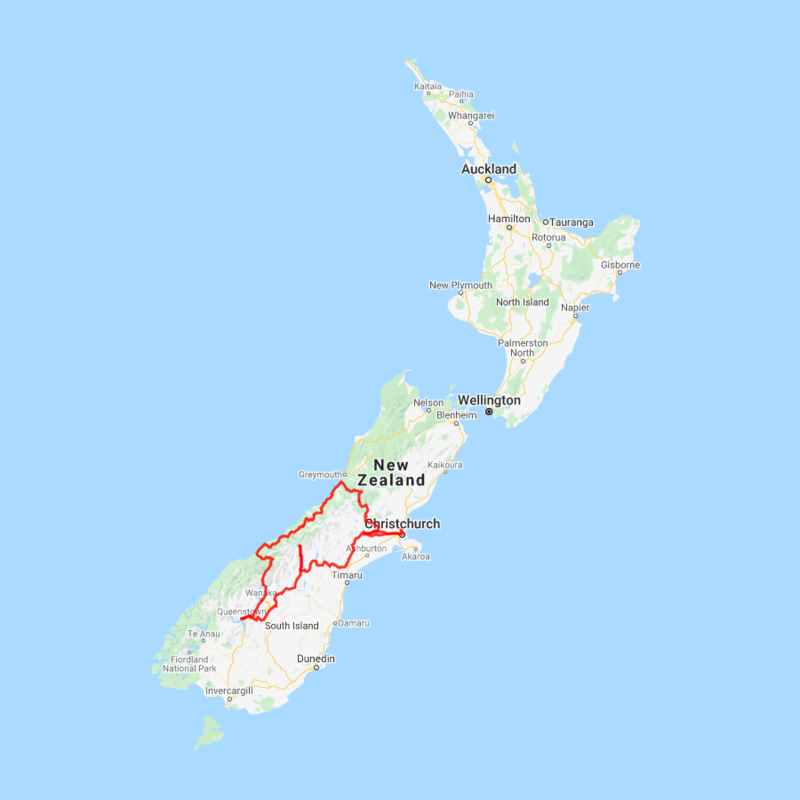 You can expect to spend around NZ$205 in fuel cost on this itinerary based on an intermediate sized car. With a backdrop of the razorback Remarkables mountain range and an armchair view of an outstanding lake and mountain panorama, Jack's Point Golf Course is not only one of the most spectacular in the world, but as an 18 hole par 72 championship course it offers golfers of any calibre a challenging and unforgettable experience. The course measures 6388 metres (6906 yards) from the championship tees and is built on the most spectacular of Jack's Point terrain, weaving through tussock grasslands, dramatic rock outcrops, steep bluffs and swathes of native bush to the edge of Lake Wakatipu. Nestled in lush rainforest, the Glacier Hot Pools is a haven of natural tranquility. Wash off the day and rejuvenate in this unique forest paradise. Your Private Pool will be surrounded by majestic rainforest and offer total seclusion, naturally. This experience includes private changing facilities with towels and complimentary entry into the Main Pools. The fresh glacier water for the Private Pools is re-filtered after every use. Offering guests an 18-hole championship golf course, this challenging par 72 course offers a choice of four tees on each hole and incorporates 10 lakes and over 60 bunkers. The spectacular views pose a constant challenge for players to keep their eye on the ball! Terrace Downs also features deluxe accommodation, a selection of dining areas serving signature high country cuisine, and a range of unique high country activities. Follow the inland scenic route through the tiny villages of Glenroy and Glentunnel, towards the garden city of Chrischruch then onto Clearwater Resort. The Hills was designed by Darby Partners and opened in 2007 to host the New Zealand Open. Set over 500 acres of land across a glacial valley the layout highlights the dramatic elevation changes and rocky schist outcrops that are a feature of the area. This championship layout provides a serious challenge for accomplished players while thoughtful and considerate design means that the golf course is equally enjoyable for golfers of all abilities. The beauty of the courses lakes, waterways and wetland areas are complimented by a stunning array of sculptures made by local and international artists.